Earn 4.5 SB per $ when you buy Overstock.com gift cards at MyGiftCardsPlus. 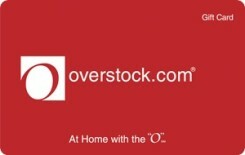 Overstock.com is an online retailer offering a wide variety of high-quality, brand-name merchandise at discount prices, including bedding, home decor, appliances, watches, jewelry, electronics, sporting goods, clothing and shoes. We give customers an opportunity to shop for bargains conveniently, while offering manufacturers, distributors and other retailers an alternative sales channel for liquidating their inventory.